Stever's is a chocolatier located on Park Avenue across from 7-Eleven. Hours, including Sunday, are extended near holidays. Douglas Stever learned how to make candy after returning from his WWII service. In 1946 he and his wife Hilda opened their first shop on Goodman Street. For awhile they were running three shops, one on Goodman Street, one on Park Ave, and one on West Henrietta, but since 1970 only the Park Ave location remains. Kevin Stever ran the business with his parents until his father's passing. 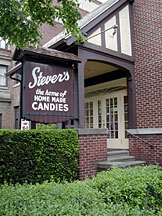 Kevin & his wife Leslie have been running Stever's Candies Inc. since 1984. The building that Stever's is in was built in 1911 as a telephone exchange. It became a candy shop in 1939. First as Reed's Candies, then Byrel's Candies, and in 1960 Stever's Candies.